A gloomy atmosphere is prevailing this week in the Polisario headquarters in Tindouf, according to an informed source from the Sahrawi camps in Algeria. The reason that plunged them in low-spiritedness is the success of the Moroccan King’s visit to France and the praises he was bestowed by the French President. 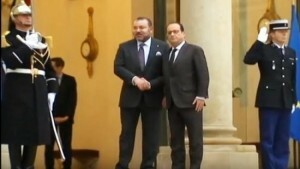 President Francois Hollande hailed the crucial role of Morocco in the Maghreb and in the UN-sponsored reconciliation process which was crowned by the Skhirat agreement on the formation of a national unity government in Libya. The two leaders, while emphasizing that the Libyan crisis poses great challenges to security in the Maghreb and Western Mediterranean, called the internationally recognized Libyan parliament to endorse the soonest possible the new government of national unity. According to the same source, Algerian officials are also as depressed as the separatist front leaders by Morocco’s diplomatic breakthrough. Both of them were expecting a virulent media and diplomatic campaign about the Sahara issue that would isolate the kingdom. But their expectation did not come true. Although the Polisario’s lobbyists, lavishly funded by Algeria, are still trying to spoil Morocco’s relations with Europe, their attempts have shown their limits and Morocco’s diplomacy proved resilient. Mohammed VI’s visit to Paris where he was received with great pomp by François Hollande confirms the role of the Kingdom as a key player on the regional and international scene, as does the exchange of visits between the two heads of state that intensified in recent months. Actually, François Hollande visited Morocco in September 2015 and Mohammed VI visited the French President at the Elysée, just a week after the terrorist attacks in Paris on November 13. Moreover, Mohammed VI and Hollande repeatedly voiced their shared determination to give a new momentum to the close cooperation between Paris and Rabat in the fight against terrorism, cross-border crime, and de-radicalization and also to upgrade their triangular cooperation in Africa.